Recently I have been looking up the places we all hear about but are not aloud to visit in person. While conducting my research, I stumbled onto something rather strange. There are dozens of locations all around the world, that can not be seen through the Google maps server. I have compiled a list of five places that Google either, chooses not to include or is not allowed to include for some legal reason. 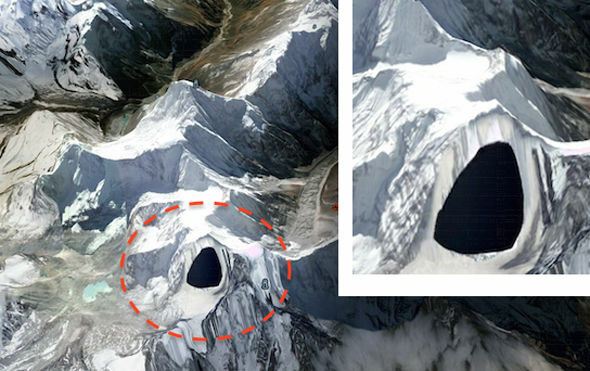 Starting the list at number five is, Kangtega otherwise known as, “The Snow Saddle.” Located high in the middle of the Himalaya Mountains, this treacherous peak is completely blacked out on Google. There are a few theories on what is actually located here, however one really stuck out. It is believed by some that Nazis during world war two occupied a underground base here. The base was supposed to be used for alien research. As an American this story is almost nostalgic in comparison to our next location. Number four, located in the middle of the Nevada dessert there is an Air Force base that no one reading this will ever get to see in person, unless of course your lucky enough to land a job here. The military black site known as Area 51 has been clouded with controversy for decades. The base is known for supposed alien research in underground labs and the replicating of extraterrestrial air craft to enhance our Air Force. The employees of this base are flown in and out to prevent any kind of corruption. In the early nineties Area 51 faced multiple lawsuits for burning nuclear waste in giant open trenches, causing employees to get fatally ill. The nations top scientists to this day still cannot identify the substances that caused the severe rashes and illness. Up until the lawsuits there was complete denial of any military site located in the Nevada desert. Coming in at number three, the Democratic People’s Republic of Korea. Since the divide of North and South Korea in 1945, North Korea has shut it self off completely from the rest of the world. Now ran by the Supreme Leader Kim Jong-un, the population of North Korea continues to be fed propaganda and forced fed the ideals that have carried down from Kim Il-sung, Kim Jong-un’s grand father and proclaimed founder of North Korea. It is believed that there is severe famine and poverty here, unfortunately it is almost impossible to prove. The small amount of outsiders that get to visit North Korea are given a very strict set of rules to follow along with 24-hour guides. The guides show you only what they are told to, any wandering outside the lines and you will be asked to leave. There is zero satellite images of the country do to the unstable relationship between North Korea and the rest of the world. Lets take a break from all the government and move on to our number two pick, Colonel Harland Sanders, founder of Kentucky Fried Chicken. That’s right, the Colonels face will never be seen on Google maps. Kentucky Fried Chicken was founded by Colonel Harland Sanders in March of 1930. The first franchise opened 22 years later in Salt Lake City, Utah. The legendary 11 herbs and spices may be the most mysterious thing about Kentucky Fried Chicken. The Colonel has never released the secret recipe to the public other than salt and pepper. Sanders sold the company in 1964, and later passed away in December 1980 at the age of 90. 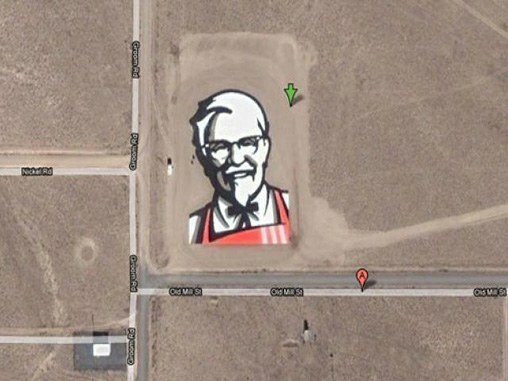 Google maps is legally not allowed to show the Colonels face on any Kentucky Fried Chicken restaurants simply because the Colonel was a real person. The legacy lives on. Finally our number one place Google will not let you see. The FEMA concentration camps, being built all around America by the Federal Emergency Management Agency. If any one has been following alternative media over the last couple years you more than likely have been bombarded by this theory. Under the Reagan administration Rex 84 was created by FEMA deputy director John Brinkerhoff. Rex 84 is an exercise to prepare the armed forces for mass civil unrest through the enforcement of martial law. Once martial law is enforced there will be mass amounts of United States citizens put in these internment style camps. A few of the supposed sites are blacked out on Google Earth for obvious reasons. These areas are all secluded and owned By FEMA , which is why this made number one on our list. Out of all the blocked places I have found, the FEMA camp theory is the only one that caused a little fear that this might actually be going on right under our noses. I hope you enjoyed this list of truely unique places.